With its 64-bit architecture and new AAX plug-in format, Pro Tools 11 cuts ties with the past — for the sake of impressive performance gains. If Pro Tools 10 was a watershed release in the product's history, Pro Tools 11 marks the beginning of a new era for Avid's audio production platform. It brings together everything Avid have been working on for the last four years — a new audio engine, a new plug-in architecture, and the latest native and DSP-based hardware — in one modern, 64-bit application. However, the culmination of all of these new technologies comes at the expense of backwards compatibility. Unless you're an HDX, HD Native, or completely native user, the upgrade to Pro Tools 11 for you could be larger and more expensive than it will be for others. Pro Tools 11 discontinues support for 'legacy' Pro Tools HD Accel systems, including the 'blue' interfaces introduced over a decade ago with the original Pro Tools HD. This is obviously going to irritate a great many people: specifically, those who have been happily running the Pro Tools 10 software on their HD systems. However, in Avid's defence, the company were very clear that this would be the case when Pro Tools 10 was released; so while it will be a bitter pill for many to swallow, the prescription was written nearly two years ago. If you're running HD cards, you'll need to upgrade to HDX or HD Native hardware to use Pro Tools HD 11, although it might be possible to continue using the 'blue' interfaces. Avid have said they are no longer supported, but it was mentioned in a 'webinar' on their web site that the company haven't actively done anything to specifically make them not work. So you might get lucky, but it's probably safer to assume that you'll need new interfaces when trading in your old gear for a new system. 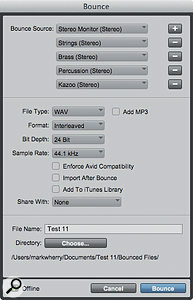 Pro Tools 11 also marks the end of the Complete Production Toolkit (CPTK), which enabled users of the software-only Pro Tools to gain access to features found in the Pro Tools HD application. The situation regarding toolkits has often been prone to confusion, especially because since the release of Pro Tools 8, as you may know, it's been possible to run both the software-only version of Pro Tools and the Pro Tools HD application on computers without Avid audio hardware. However, because you could only get the Pro Tools HD application by purchasing an HD system, Avid offered the CPTK as a way to get the same features as if you were running the Pro Tools HD 10 software without the HD or HDX hardware. Initially, I assumed that ditching the CPTK and having just Pro Tools and Pro Tools HD made a great deal of sense, since Avid would presumably now allow users to buy a software-only licence for Pro Tools HD... Wrong. While Pro Tools 10 and CPTK users get the chance to upgrade to the Pro Tools HD 11 software, there will no longer be a way for software-only Pro Tools users to get HD functionality without buying HD hardware. This means that the cost to access HD features becomes significantly higher with Pro Tools 11. Where you could buy a CPTK licence for £1559 (for a total of £2098 with the original Pro Tools licence), the cheapest HD system you can purchase is an HD Native card with an HD Omni interface for £4500 or so. And, disappointingly, you don't seem to be able to purchase an HD Native system unbundled from an audio interface that you may or may not need if you just want the licence. I was fortunate enough to be included in the list of beta-testers for Pro Tools 11, so I got to try the new version earlier than others, and the first thing I noticed was that installing Pro Tools on a Mac is now easier than ever before. There's no longer an installer: you simply drag the Pro Tools application to the Applications folder, although this doesn't mean that Pro Tools is ready to run straight away. When you first launch the application, there's still a degree of housekeeping and setup that must be performed before you can actually open or create a new Session. Windows users get the same old installer as before, but on both platforms it's possible to install Pro Tools 11 alongside an existing Pro Tools 10 installation, which is rather handy. And, in fact, Pro Tools 11 includes a licence for Pro Tools 10, so any Pro Tools 11 user can also run Pro Tools 10 as well, should they wish. While I'm on the subject of installation, Pro Tools 11 also uses the latest copy-protection technology from PACE, meaning that you'll need a second-generation iLok to use your Pro Tools authorisation. This new system, along with the new iLok License Manager desktop application, caused quite a headache when Pro Tools 11 was first rolled out, but at the time I was finishing this article, in late July, most of the issues experienced by early adopters seemed to have been resolved. The only point to note about the new copy protection is that, unlike the original iLok system, if you remove the iLok 2 while Pro Tools is running, it will at some point inform you of its absence, and you'll either get the option to reinsert your iLok to save the Session before Pro Tools quits, or you might get the option to carry on working if the iLok is reinserted. In my experience, the former option is the most likely. Perhaps the most significant change in Pro Tools 11 is that the application is now, finally, a 64-bit one. Although Pro Tools 10's disk cache feature could utilise 64-bit memory addressing by running in a separate process, Pro Tools 11 is fully 64-bit, and the disk cache is now part of the Pro Tools process itself. That 64-bit support will greatly benefit anyone working with large sessions almost goes without saying, but it has the biggest implications for working with plug-ins. If you run a large number of virtual instruments, and especially software samplers, memory in a 32-bit system could become scarce quicker than a drop of Grand Marnier Cent Cinquantenaire shortly after the bottle has been opened. The down side of this is that because Pro Tools 11 is a 64-bit application, it can only run 64-bit plug-ins; and, specifically, it can only run 64-bit AAX plug-ins. While this might initially come as a shock, the move to an AAX-exclusive Pro Tools was a necessary one, as it would have been pretty much impossible for Avid's engineers to bring AudioSuite, RTAS and TDM into the 64-bit world. Fortunately, there are a few up-sides. Firstly, a large number of companies have already created 32-bit AAX plug-ins since the release of Pro Tools 10, and, although Pro Tools 11 cannot run 32-bit AAX plug-ins, making a 64-bit version of an existing AAX plug-in should be relatively painless for third-party developers. Indeed, there are already many, many 64-bit AAX plug-ins available (see box). And it's also worth remembering that, since Pro Tools 11 comes with a Pro Tools 10 licence and users can run Pro Tools 10 on the same machine (though not at the same time), you can at least run older 32-bit AAX, TDM or RTAS plug-ins if you need to. It's not an ideal workflow, but you could use Pro Tools 10 as an audio processing environment, and then switch back to your main Session in Pro Tools 11. Possibly the biggest advantage afforded by the AAX architecture is a feature that Pro Tools users have dreamed about for a very long time: offline bouncing. Yes, the Bounce window now includes a tick box labelled Offline, which, when enabled, will tell Pro Tools to bounce your Session as quickly as possible, utilising as much CPU power as you have available — even on an HDX system where AAX DSP plug-ins are in use. The way this has been implemented involves some technical sleight of hand, and it's made possible because AAX plug-ins can contain native and DSP implementations that sound identical, because both use 32-bit floating-point algorithms. So, when you do an offline bounce, Pro Tools basically swaps any AAX DSP plug-ins for AAX Native versions, and then switches everything back once you're done. Pretty neat. 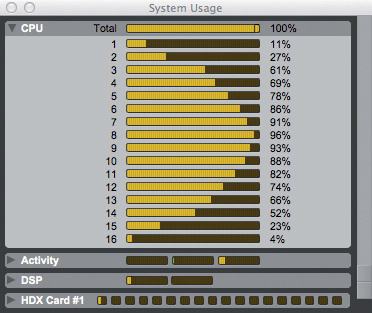 The System Usage window gives a more accurate picture of how Pro Tools is making use of your CPU resources. What this means is that you can only do an offline bounce if AAX Native versions of the plug-ins that you're using are available, although this shouldn't be a huge problem as, at present, it's far more common to see AAX Native plug-ins not support AAX DSP than the other way around. It's also worth noting that there are some situations where offline bouncing might even be slower than real-time bouncing on HDX systems — if you had a massive Session that used a large amount of both native and DSP-based plug-ins, trying to calculate all of that on the native side would create something of a bottleneck. In most real-world cases, however, you'll find that offline bouncing is significantly faster than real-time export, especially if you have most of the Session in the disk cache. Factors of 10 times faster than real time were not uncommon in the various Sessions I tried. There's also a cherry on the bouncing cake for Pro Tools HD users, since Avid have added the ability for multiple sources (up to 16) to be bounced simultaneously. 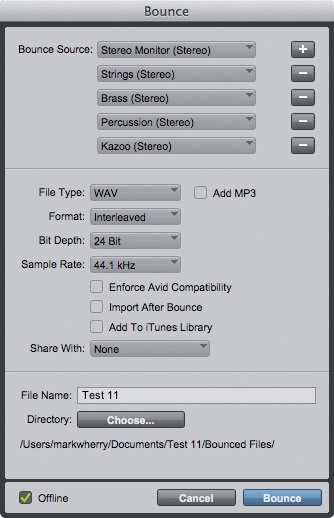 This is obviously incredibly useful for those printing/recording stems from Pro Tools, where they might want to bounce a reference mix as well as various subgroups, such as strings, brass, percussion, and so on. To add additional bounce sources, just click the plus button next to the first bounce source and then set up the source from the available buses and outputs. 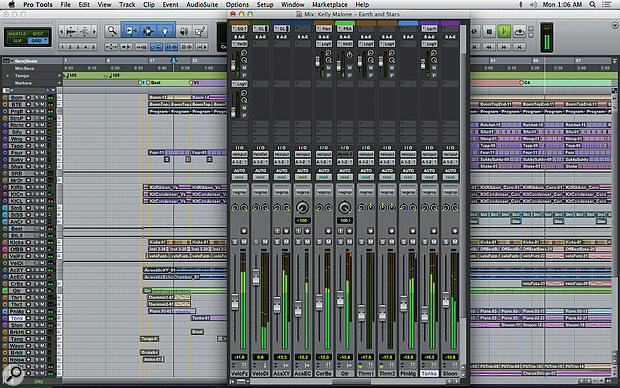 Pro Tools 11 implements two new under-the-bonnet engines for handling video and audio. The new Avid Video Engine is apparently taken from Avid's flagship video-editing program, Media Composer X. This is very handy for those involved in post-production, but it's the new Avid Audio Engine that will have the majority of Pro Tools users atwitter. The new audio engine has dramatically better support for handling processors with multiple cores, and there are a few visual clues in the user interface that something more intelligent is going on. Firstly, rather than separate CPU meters for processing tasks such as Clip Gain and Elastic Audio, there is now one Total meter in the System Usage window, accompanied by individual performance meters representing the performance of each audio thread. So, on my dual-quad-core Mac Pro with Hyperthreading, I now see 16 meters. Secondly, in the Playback Engine window, gone are the settings for the number of Host Processors to use and the ability to set a CPU Usage Limit. These are all good signs. To get a rough idea of how much of a performance improvement you can expect in PT 11 versus PT 10, I performed a somewhat clinical number-of-reverbs test. While this, admittedly, doesn't represent a real-word situation, it does at least suggest the amount of raw power that can be expected. The Bounce window: now with a new Offline tick box and, for Pro Tools HD users, the ability to bounce multiple sources simultaneously. 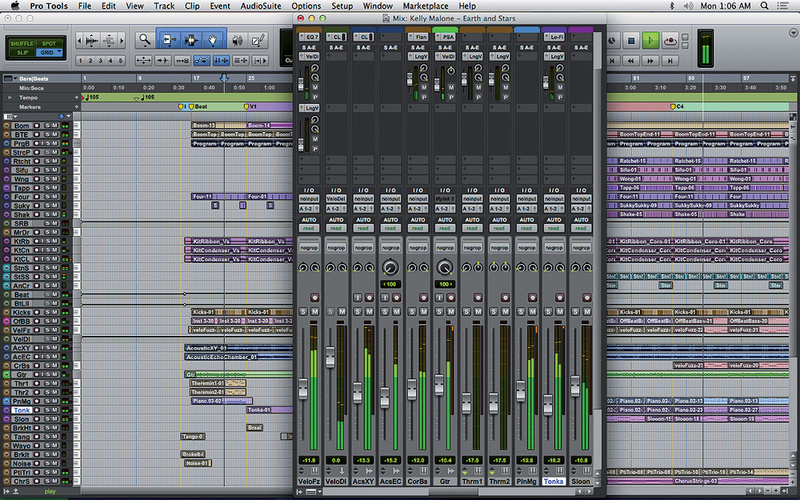 Starting in Pro Tools 10, I began stacking up native ReVibe II plug-ins on a single audio track playing back a test tone. Although the system seemed happy with seven, adding an eighth brought the audio engine to its knees, reaching the limit of what's possible with a single core. So I started duplicating tracks with seven inserts, later having to scale back to six ReVibe IIs per track, and ended up with eight tracks each playing six reverbs — 48 instances in total. Adding another audio track with even one additional insert brought up our old friend, the -9171 error: "audio processing could not complete”. This test was carried out with a buffer size of 256 samples, eight host processors, and an 85 percent CPU usage limit. I later tried enabling 16 host processors with a 90 percent CPU limit and was able to get an additional track with a further five ReVibe II plug-ins, but it seemed very much that I was skirting the edge of what was possible. So the final total for Pro Tools 10 was 53 ReVibe II instances, with the CPU Total reporting around 80 percent usage. 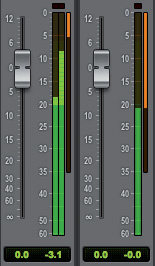 Moving onto Pro Tools 11, with the 256-sample buffer, the improvement was immediately noticeable. It was possible to have all 10 insert slots on a track occupied with ReVibe II plug-ins, and then duplicate this 11 times to have 12 tracks, each with 10 inserts, for a total of 120 instances. It very much felt like I was on the very edge of what was possible, and the CPU Total was right up to 100 percent, but this is clearly a staggering improvement over the previous version. If all Avid had done was to improve the performance as described, that would have been a great achievement — but they've gone one better. Pro Tools 11's new audio engine also has a feature called Dynamic Plug-in Processing, where native plug-ins are temporarily deactivated if Pro Tools detects that they're not actually processing any signal. This means that when Pro Tools is stopped and no audio is active, the CPU use drops down to effectively nothing; in previous versions of Pro Tools, plug-ins would remain active all the time, basically processing silence, even when they weren't required to be doing anything. Dynamic Plug-in Processing won't be all that useful if you have a Session with non-stop audio on every track, of course, but this is rarely how Sessions are constructed. 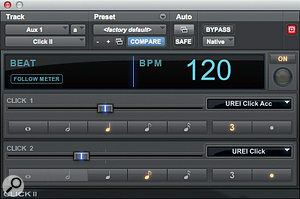 For situations where you have a set of tracks with a heavy processing requirement at the beginning of a Session, and a completely different set of tracks and processing at the end, the plug-ins used to process audio at the beginning will no longer take cycles away from the processing that happens at the end. Equally, if you build up Sessions by chequerboarding tracks, plug-ins will be activated and deactivated as required, giving you even more processing resources than you thought were available. And should Dynamic Plug-in Processing fool you to the point where your Session won't play back any more, Avid have made it possible to disable this mode in the Playback Engine window. Last, but not least, the new audio engine has dual buffers, one for playback tracks which is "set dynamically according to what the session needs for reliable playback”, and a separate input buffer for record-enabled or input-monitored tracks. This can be set to a much lower value, allowing low-latency monitoring of input signals through plug-ins, and immediate response when playing soft synths live. And, speaking of latency, the Delay Compensation Engine setting has been removed from the Playback Engine window, and if delay compensation is enabled, you now get what was previously the maximum setting by default. This makes sense, since the only reason to make it variable was due to hardware differences between HD and HDX cards, the former of which are no longer supported. In addition to the new audio engine, Avid have also made some improvements to the on-screen mixer. The level meters are now 30 percent larger than before, making them easier to see from a distance, and can be configured to show different types of metering ballistics and scales. The four main options are the default Sample Peak (which, according to the manual, "shows all dynamic activity of the digital signal at every moment in time”), Pro Tools Classic, Venue Peak and Venue RMS. The Venue options are a handy addition for those are used to working with Avid's live sound consoles, or, more likely, anyone who is recording to Pro Tools from a Venue console. 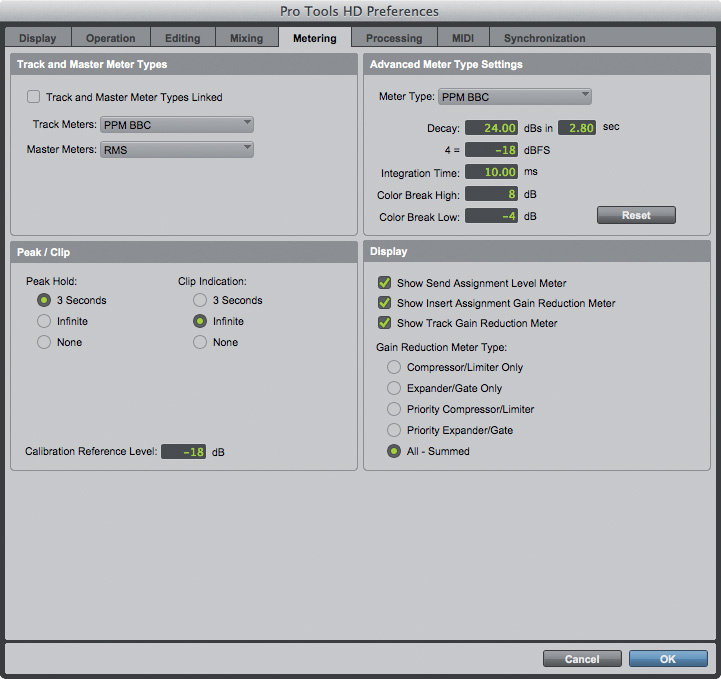 Pro Tools' level meters, now 30 percent larger in version 11 and with the ability to show gain reduction as well. Pro Tools HD users get 13 extra metering options, including an extended Linear mode that scales down to -60dB (as opposed to -40dB), RMS, VU, Digital VU, and three K-scale meters (K-12, K-14 and K-20). There are also five PPM (Peak Programme Meter) modes covering various broadcast standards: Digital (which is popular in US film and used on Avid's System 5 consoles), BBC, DIN (used in German broadcasting), Nordic (a Scandinavian variant on DIN) and EBU (European Broadcasting Union). 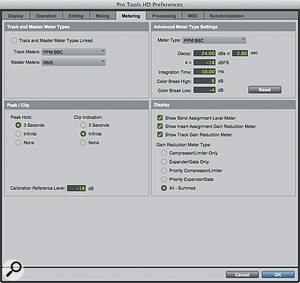 You can select the various metering options by right-clicking any meter, whether on the Mix or Editor windows, or the new Output Meters available in the Edit and Transport windows; and, if this wasn't enough, there's a whole new Metering page in Pro Tools's Preferences window to fine-tune how these options are displayed. The new Metering Preferences page offers a way to configure Pro Tools 11's new level and gain-reduction metering functionality. My only small criticism of the new metering is the very fact that the level meter is indeed now 30 percent larger than before. While great for those who want to see the metering more clearly, it also means you lose a few vertical pixels. It would have been really nice if Avid could have made it possible to vertically resize the fader and meter in the same way as you can with Cubase and Nuendo, so you could decide for yourself between clearer metering and seeing more controls. Another interesting metering improvement for Pro Tools HD users is that it's now possible to display a Gain Reduction meter alongside the basic level meter, which shows the amount of gain reduction being applied to a given channel by any processing that might be employed. The gain reduction appears if you have 'Show Track Gain Reduction Meter' ticked in either the meter's pop-up menu or the Metering Preferences, and you have a dynamics plug-in inserted on that track. You can also specify whether the meter shows only Compressor/Limiter gain reduction or Expander/Gate, whether it prioritises one type of gain reduction over another (depending on the types of plug-in being used on a track), or the sum all of the gain reduction taking place. An additional nice touch is that a miniature gain-reduction meter is also shown on individual insert slots, but a minor annoyance is that the meter pop-up menu can only be opened by right-clicking in the level meter, rather than the gain-reduction meter, which is a bit counter-intuitive when you want to change a setting for the gain-reduction meter. 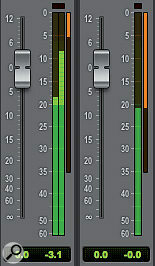 For the gain-reduction meter to work, a plug-in must be able to report the amount of gain reduction to Pro Tools. The good news is that pretty much every dynamics plug-in is already capable of doing this: Avid's D-Control and D-Command surfaces have LED gain-reduction meters, so to support this feature, plug-ins have had to implement gain-reduction reporting for some time. As well as the new metering options, it's now also possible to see expanded send views for any or all of the 10 sends simultaneously, which should make quite a few users happy. And, sticking with the theme of improved metering, sends can now show a miniature level meter (when not expanded) so you can see at a glance if any signal is being, well, sent. These miniature meters are also visible on the Edit window where sends are displayed. Pro Tools 11 is a major, under-the-bonnet engine change that both increases performance and makes possible new features such as offline bouncing. There are many who had hoped Avid would bring Pro Tools into the 64-bit universe sooner, but it's clear that they have been undertaking a significant transition over versions 9 and 10 — and the introduction of the HDX hardware — to make Pro Tools 11 possible. And, ultimately, by using version 10 as something of a stepping-stone release to Pro Tools 11, Avid were able to keep existing users supported while also introducing new technologies such as HDX and AAX. Some users may feel disappointed that the Pro Tools application itself has received less attention than the engine (there's still no way to organise tracks into folders, for example), but I think most will probably agree that 64-bit compatibility overshadows most other wish-list items, especially as it's accompanied by a new audio engine that delivers significant performance improvements and finally makes offline bouncing possible. There are actually quite a large number of non-headline features I didn't have space to discuss that probably answer the cries of a great many users across the board. For example, the various browser windows have been consolidated into a new Workspace Browser, with the underlying DigiBase being replaced by a modern database engine that aims to improve searching, browsing and relinking. You now get twice as many levels of Undo (64) and double the number of Instrument tracks, with Pro Tools and Pro Tools HD now offering 128 and 256 Instrument tracks respectively. Last, but not least, automation data is now properly time-stamped, and it's possible to record automation while in Record mode. In terms of pricing, the prices are in keeping with what Avid have charged in the past. Some users may feel the costs are steep for what is mostly an engine update with some short-term compatibility issues, but the extra power you get with Pro Tools 11 is going to be very valuable, and if you were considering purchasing a Satellite or Video Link LE licence, which are priced at $749 and $250 respectively on Avid's web site, the upgrade price might be considered something of a bargain. Given the power of the new audio engine, and that it's now possible to do so much on a native or HD Native system, you could be left wondering whether HDX cards are even still necessary. When I reviewed HDX in April 2012 (see the review at /sos/apr12/articles/avid-hdx.htm), I commented that "there's something beneficial about the deterministic nature of a hardware DSP system versus a completely native approach. And even though the native-vs-DSP argument has clearly become less relevant, Pro Tools still stands as one of the few systems that can offer the user the best of both worlds, especially when required to handle large amounts of I/O.” In a way, those comments still represent my thoughts a year later with Pro Tools 11. Having more power on native Pro Tools systems gives you more choice in how you choose and use Pro Tools, and I've never met an HD user who complained about having too many resources available! Given that Pro Tools 11 can only use 64-bit AAX plug-ins, the availability of plug-ins in this format is obviously rather important. Thankfully, Avid have ported virtually their entire catalogue, including the AIR Creative Collection (which has its own installer). The exceptions mostly include plug-ins which had been developed or distributed in collaboration with third parties, such as Dolby's Surround Tools, Line 6's Amp Farm and Echo Farm, and TC Electronic's plug-ins (including the much-loved Master X3). TL Space (a plug-in that came under the Avid roof after the acquisition of Trillian Lane Labs in 2006) also seems to be left behind in the RTAS/TDM past, and TL Click is another plug-in that didn't make it to AAX. However, to fill the gap, Avid have instead provided an upgraded version of their own Click plug-in. 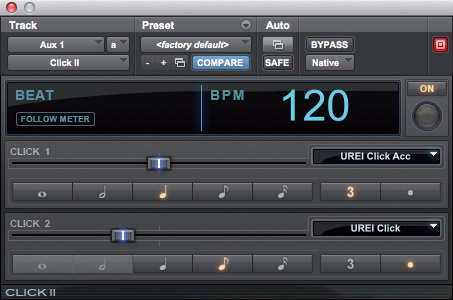 The new Click II provides two separate clicks, which are independent both in terms of rhythm and sound. The new Click II plug-in can be configured to have two independent clicks, each with its own volume, rhythm and sound. The situation for third-party plug-ins varies from developer to developer, although many companies were ready with 64-bit AAX variants of their wares in time for the Pro Tools 11 release. McDSP have native and DSP compatibility for all of their v5 products, except for Revolver and Channel G, which are apparently still in the process of being ported. Neyrinck's SoundCode LtRt Tools and V-Mon are compatible, as are Wave Arts' AAX plug-ins and Source Elements' Source Connect. As mentioned in the main text, many developers already have 32-bit AAX plug-ins shipping, and the process of making them 64-bit-compatible should, in most cases, be relatively straightforward. Sonnox already have five plug-ins available that support 32-bit AAX, and they say that "Updates are in final-stage development for use with Pro Tools 11.” However, some companies have been slower in adopting AAX at all. Sound Toys' web site says that "Pro Tools 11 support is in the works,” and, as of 22nd June, Waves released a news story saying that the company were "still working closely with Avid to prepare AAX Native support, and expect to achieve full compatibility very soon”. Pro Tools 11 £550.80; upgrade from Pro Tools 10 £238.80; upgrade from Pro Tools 9 £310.80; crossgrade from Pro Tools Express £394.80. Pro Tools HD 11 upgrade from Pro Tools HD 10 or Pro Tools 10 with Complete Production Toolkit £478.80; upgrade from Pro Tools HD 9 or Pro Tools 9 with Complete Production Toolkit £790.80. Pro Tools 11 $699; upgrade from Pro Tools 10 $299; upgrade from Pro Tools 9 $399; upgrade from Pro Tools LE or M-Powered $399. Pro Tools HD 11 upgrade from Pro Tools HD 10 $599; upgrade from Pro Tools HD 9 $999. Pro Tools is finally a 64-bit application. The new audio engine improves performance and makes possible long-sought-after features such as offline bouncing. The metering options with the gain-reduction meter are a nice touch. It might take some time before you can use all your third-party plug-ins in Pro Tools 11. Avid have created a distinction between Pro Tools and Pro Tools HD, making it impossible to get HD software features without buying HD hardware. Pro Tools 11 eschews legacy software and hardware technologies to take Pro Tools' functionality and performance to the next level. HDX card and HD Omni interface. Apple Mac Pro (2009) with dual 2.93GHz quad-core Intel Xeon Processors, 16GB memory and Nvidia GeForce GT 120 graphics, running Mac OS 10.8.4.